There’s a reason tabloids, celebrity websites, and reality shows are so popular these days; people love getting a glimpse into the “real” lives of other people, both famous and unknown. I’ll admit that I’ve been known to watch a few shall-remain-nameless reality TV shows, and naturally, I read People magazine every week. Honestly, I am often just as interested in the non-famous as I am the latest celebrity: the 12 year old artist raising money for soldiers overseas, the man that’s fostering four kids on his own, or the woman that has escaped a polygamous marriage. 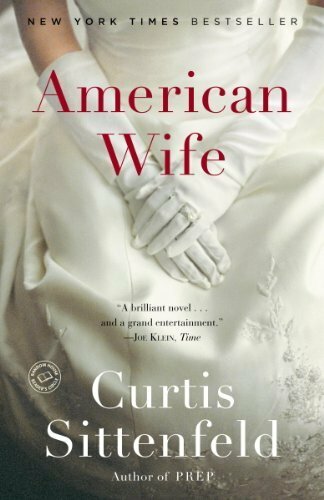 Stepping into another’s shoes is a fascinating experience, and American Wife: A Novel offers this very kind of people-watching to the extreme; all together, it’s an absorbing, affecting, and addicting read. Curtis Sittenfeld gives us the best of both worlds here: the mix of the quiet and dramatic typical of a “normal” life as well as the under-the-microscope existence of someone thrust onto a highly watched and scrutinized platform. Sittenfeld exquisitely captures this transition from an ordinary life to a life of extraordinary pressure and power. Her protagonist, Alice, is to eventually become the First Lady, and her story is loosely based on Laura Bush’s life, which adds intrigue for those interested in American history and politics, myself included (I’m glued to CNN, FoxNews, and the rest every election year!). However, politics do not feature prominently in this novel, and the author does a fine job of staying neutral; I would say it’s much more a story of character and moral complexities that just happens to be set on a world-changing stage. In fact, most of the more intimate, captivating moments happen during Alice’s simple childhood and adolescence (made traumatic by one horrifying, life-changing moment). When she somewhat recovers and begins dating her husband, the future President, the author also does a fine job of illustrating the balance of remaining one’s self and also integrating into a consuming, essentially brand new family and identity (“wife” and “mother” trumping over who Alice used to be – this is one of her primary struggles, and I felt many women might empathize). Because of the dynamic portrayal of Alice, a thoughtful and intelligent narrator, and the ability through the narrative to become privy to her scandalous yet substantial life, I thoroughly enjoyed this novel. In fact, I couldn’t put it down – the character study and plot pace were just that engrossing. Sittenfeld did an excellent job of keeping a tight plot focus; the most interesting and absorbing moments of Alice’s life were expanded and fully felt, while the pacing of the more ordinary events was structured enough to keep the reader involved but not unengaged. The novel’s tendency to dwell in the thematic grey spaces – not everything is clearly right or wrong, good or bad – reflected life in a very real way, and I found it very easy to empathize with and embrace Sittenfeld’s First Lady throughout both her troubling decisions as well as her great accomplishments.